Today marks the Thirteenth anniversary of the terrorist attacks on our country on september eleventh of 2001. For me, like countless others, this day is permanently etched into my mind and like most I remember the exact moment it unfolded. For me it was a crystal clear fall day out in the country photographing blue morning glories on a farm, when the radio began to crackle with hints of something unspeakable. I recall driving as fast as I could to get to a television and being glued to it for days. Take a moment today to think of and pray for those who were lost that day, and especially their families who were left to cope with such heartbreak. Every anniversary of this event, I find myself watching the documentaries on television and each and every time I am instantly taken back to that moment and overcome with a sense of deep despair, and I can’t begin to imagine the heartache for those who never got the chance to hold their loved ones again. I have never been to the twin towers memorial, but I have been to the Shanksville crash site in Pennsylvania and while it is not an over the top memorial, I can definitely say it is a place of quiet reflection that really hits you. 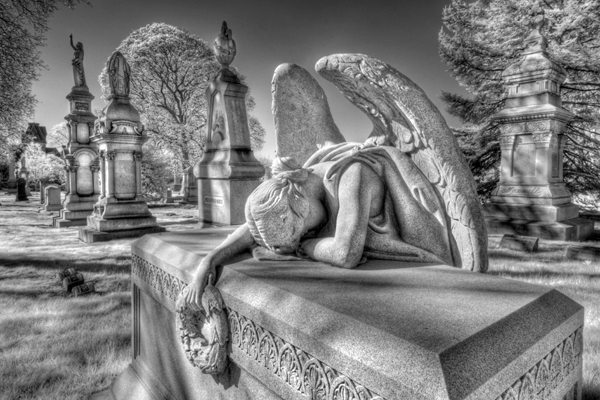 I felt this Angel statue from a cemetery in New York was a fitting image for today. It is among my favorite infrared images that I have shot. If you have a moment and care to hear Michael W. Smiths tribute song to 9-11 called ”There she stands”, I posted a link here. 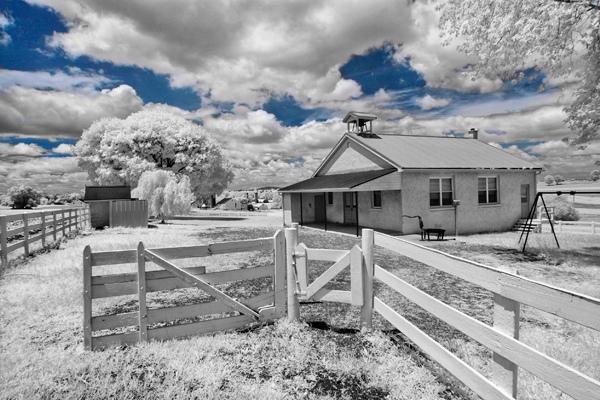 I shot this one room Amish school in infrared and converted it to reveal the blue sky.Infrared has such a unique look in many situations. 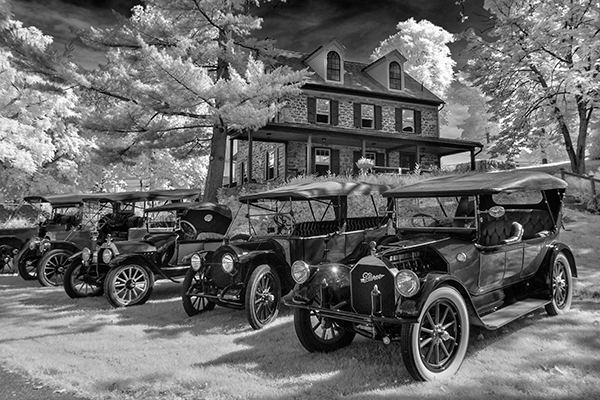 Another image of the E-M-F car group as they sit parked at Historic Poole Forge. 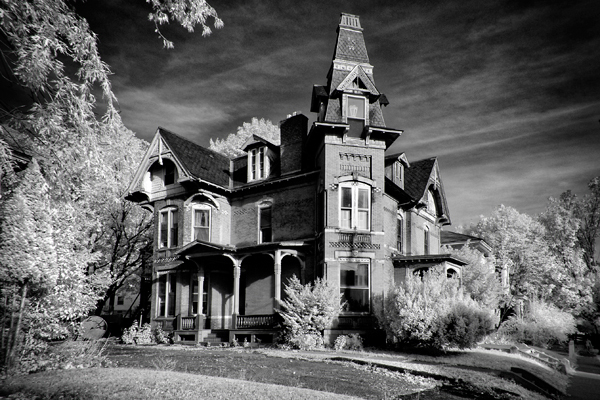 This image was shot in infrared so the foliage goes white and the sky dark.The old mansion sits on the hill in the background. This quiet little corner at mount auburn was shot in infrared which gives a dreamy effect very suited to the subject matter. The Scots’ Charitable Society is the oldest charitable organization still existing in the Western Hemisphere. Founded in 1657 and incorporated in 1786 the organization exists to help people of Scottish heritage. The society is devoted to the cultivation of personal and social relations of the members, cherishing the associations of the land from which they originated, and instilling in their fellow-countrymen a zeal for carrying on their time-honored traditions. 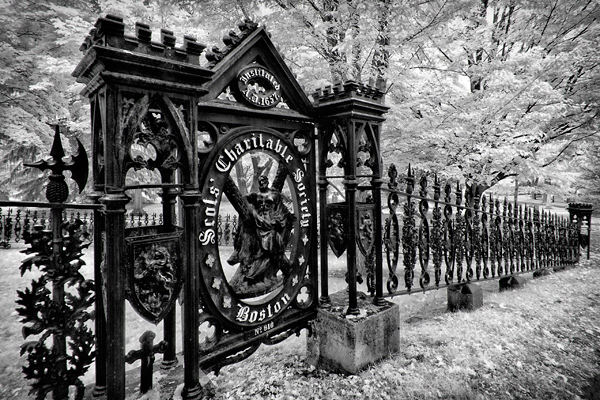 This gate and fence at Mount Auburn cemetery is stunning and pays tribute to this organization. I shot it in both infrared and color. This was just a quick grab shot on my new england trip,and the owner came out while I was snapping the shot. He proceeded to tell me it was an Irish Victorian home and had hundreds of four-leaf clovers everywhere in the construction. From door panels to fireplace inlays and everywhere you could imagine,there were four-leaf clovers. 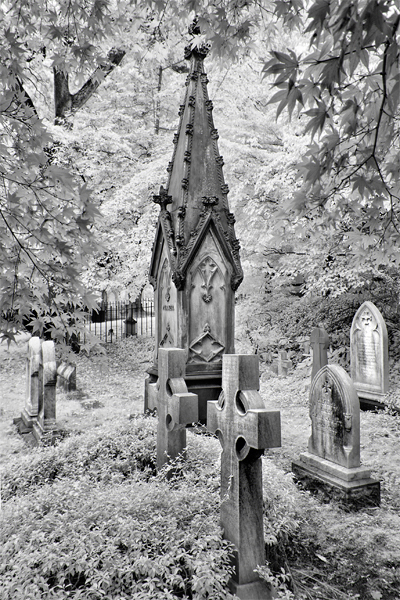 Done in infrared,it takes on a bit of a spooky appearance to me. 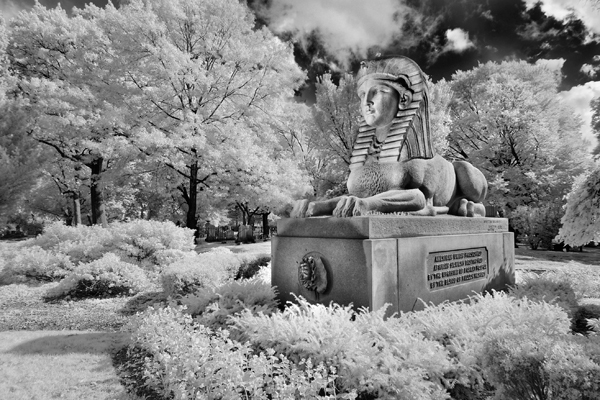 This sphinx is a bit out-of-place in a cemetery but it still is quite impressive and I shot this image in infrared. This is Martin Milmore’s Sphinx commissioned by Jacob Bigelow in commemoration of the preservation of the Union and the end of slavery. It sits facing the Bigelow chapel in mount auburn cemetery and was carved at this site from a single block of granite from Maine, it was completed in July 1872.